Karbonn Mobiles has launched a new budget smartphone called the Aura Sleek 4G. The Karbonn Aura Sleek 4G has been priced at Rs. 5940. The Karbonn Aura Sleek 4G has a 5inch FWVGA (854 x 480 pixels) IPS panel display. Herein lays a flaw with the Karbonn Aura Sleek 4G as most of smartphones in this price range have an HD resolution display. 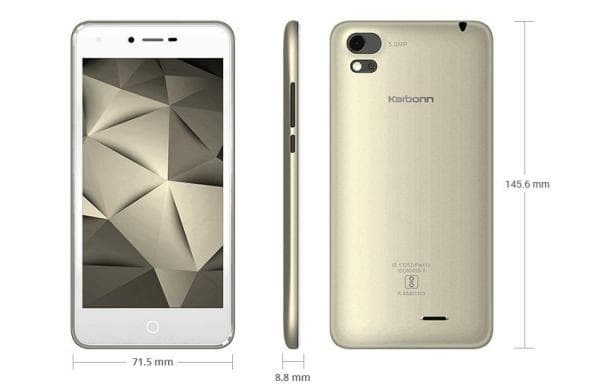 The Karbonn Aura Sleek 4G has an unspecified chipset that houses 1.25GHz quad-core processor and 1GB of RAM to run the Android Marshmallow operating system. The Karbonn Aura Sleek 4G has a special feature that allows you to change songs even while the screen is locked by simply swiping up. The Karbonn Aura Sleek 4G supports Voice over LTE (VoLTE). The Karbonn Aura Sleek 4G has an internal memory of 8GB. You can use microSD cards of up to 32GB to expand storage. The Karbonn Aura Sleek 4G has a 5MP rear camera with LED flash. The rear camera features face and smile detection along with panorama mode. On the front you have a 2MP camera for selfies. The Karbonn Aura Sleek 4G supports microUSB, Bluetooth and Wi-Fi connectivity. The Karbonn Aura Sleek 4G has a G-Sensor, accelerometer, proximity and light sensor. The Karbonn Aura Sleek 4G is powered by 2000mAh battery that is claimed to offer 8 hours of talk time on 2G and 4 hours of talk time on 4G. You can expect 130 hours of standby. The battery on the Karbonn Aura Sleek 4G can be charged completely in 2 hours and 4 minutes. The Karbonn Aura Sleek 4G is a Dual SIM capable smartphone.